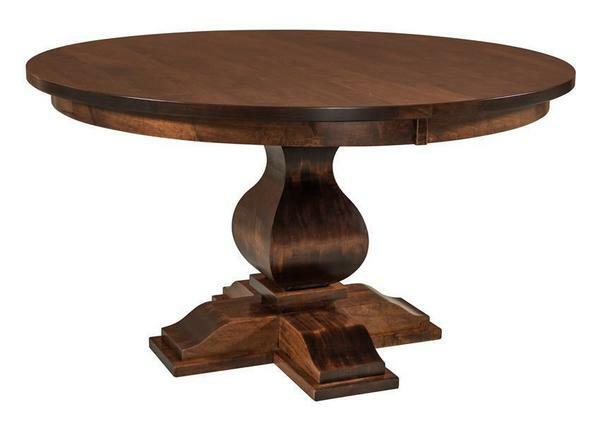 The center of your dining room should make a statement and what better way then with this Amish Barrington Single Pedestal Table. The truly unique pedestal base demonstrates the incredible attention to detail by our Amish Craftsman. This solid wood dining table is handcrafted in America for your home, setting the scene for an intimate dining experience. Available in 48", 54" or 60" to fit your space and choose your finish to bring the colors in your home. For that celebratory dinner, add up to two 12" leaves to create extra space for all your family and friends and enjoy those special moments together.